I started another spreadsheet, this time for seed sowing dates. All dates are based on my planting schedule last year, the only difference is dates were adjusted a bit to the proper lunar time. I will also be doing a schedule for direct sown veggies as that time approaches. After doing some lunar planting, that I post about below, I have a sprout already. It is a 'Bonsai' Pac Choi that was sown last night around 10pm. That's germination in just 18 hours, can't complain about that. Of course it is a brassica that germinate fast already though. I hope the peppers and celery fallow suit as they can take ages to germinate. Giant Celeriac, seed from Miss M.
Brilliant Celeriac, seed from Kathy. Red Scallions, seed from Thomas. In doing all this sowing I realized I am going to have a lot of peppers! To fit them all in some will be planted by the square foot in a raised bed, some will be grown in a hanging basket and others will be planted on top of upside down tomatoes. Last year I started some of my peppers really early and they grew much better then the later sown one. This year I decided to start all the peppers early. The greens I started will hopefully start going out in the coldframe in a couple weeks. They should provide some early salad greens which I have been craving lately. The red celery is the same ones I grew this past fall. I am hoping they turn much redder when grown in stronger sun. I have some Pasilla Pepper seed coming in the mail that I was not able to sow today. I will start them as soon as they arrive, it will provide a good comparison to lunar and non-lunar planting. The next thing coming up will be sowing all the Brassica's on March 15-16. The growing season is coming! 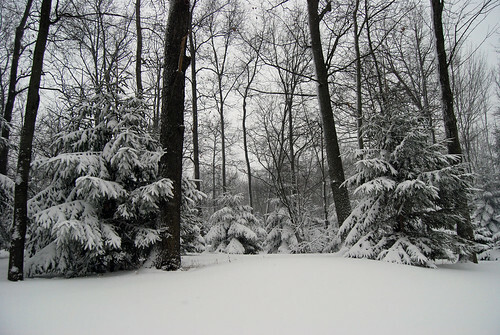 Last Monday we received our first big snow storm of the winter. It certainly was a long time coming this year. 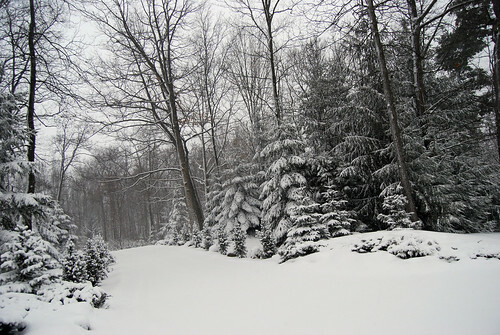 To this point we have had snow but it has always been low amounts. 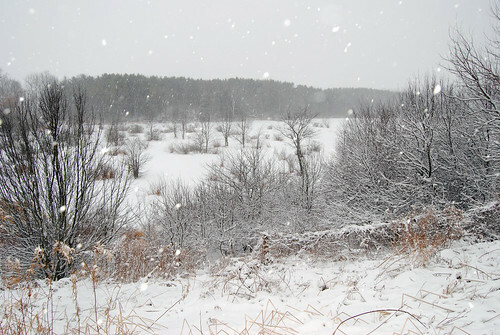 After the storm we ended up with about 20cm (8in) and it was greatly needed as things were starting to get really dry. Sounds like more is on the way for Thursday and Friday, bring it on! This season extender has by far done the best this winter. Almost everything in it has survided the winter and are looking quite healthy. This year I will only be planting winter crops in this structure. they will do something before peas take their place mid April. Mizuna, I recently cut this to the ground and it has grown back. An excellent winter crop that is quite mild tasting this time of year. Sugarloaf Chicory, A bitter green that I have yet to try. It was clearly started way to late but it is looking healthy. well into Janurary so it was a great crop. This season extender has not fared so well. 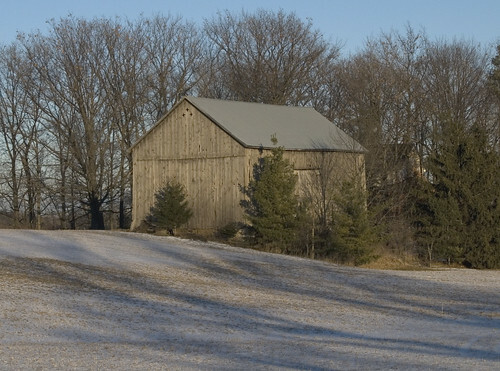 With only an inch or two of snow cover the winter winds have been getting in and doing a lot of damage. In the future I will use the cold frame for fall crops and hardening of spring crops. It seems to work best in these situations. produce a harvest in 30 days. holding out much hope for this crop. This season extender has fared quite well this winter. I used it to overwinter leeks, chard, potted perennials and the wee tatsoi. I will use it again next year but I am not sure what will be in it yet. so they have until early June to do something. The wee tatsoi has been putting on growth albeit very slowly. in the warmer days to come. I will end things off with a photo of some lady bugs that seemed to be all over the garden today. I think I must have seen at least 15 in a half hypothemic state. They need to crawl back under cover because a snow storm is coming Monday afternoon, possible our first big accumulation for this winter. 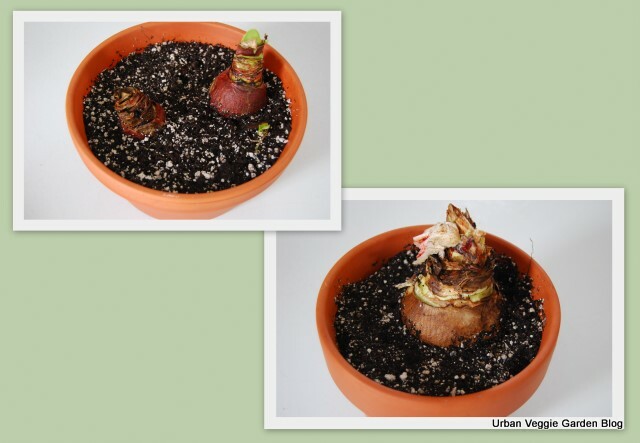 A couple days ago I potted up the two varieties of Amaryllis that I have grown for a few years. 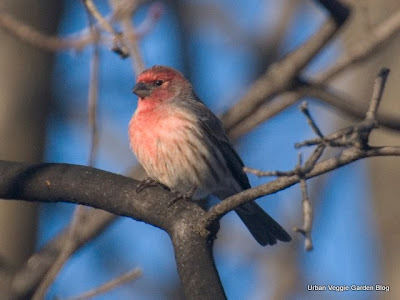 Looking back on my blog I am little late, Last year I had them potted by Jan 9th. One bulb has a bud coming but the rest are not showing much signs of life. Time will tell what kind of show they put on this year. Last year they bloomed really well which you can see at the following link. This year the bulbs have produced lots of little pups. In the past new bulbs have taken one full growing season to bloom. With this amount there should be lots of blooms next year. Here they are all potted up. I gave them a really good drink and will place them in a south facing window. At this point I will just let them do their thing and not water again until they are actively grown or if they go bone dry. To much water at this point will make the bulbs rot. I will keep y'all posted on their progress this year. The time of year has come when reality sets in. When I do a spreadsheet of all the varieties I want to grow and start fretting about were I am going to plant them all. I really tried to pare down my list this year but I think I failed. At least I didn't go crazy with ordering this year, most of my seed was from last year, seed trades and some self saved. Most multiples of each crop will be planted together instead of planting an area with one variety so that will squeeze things in. I will also be planting three hanging baskets, three upside down buckets, a half barrel and probably a pot or two. 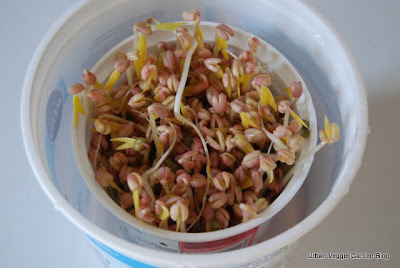 These are things a seed addict has to do! The only things I foresee being a problem finding room for are bush beans and tomatoes. 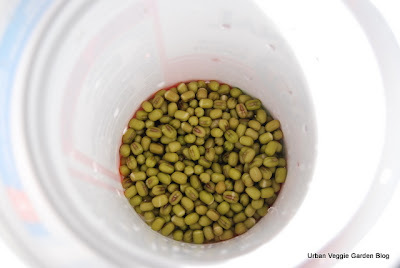 Following Thomas's tutorial I started sprouting mung beans last week. I will do a quick post about how I went about it, if you are looking for more detail please check out his tutorial. Above is the supplies I used which were all on hand and free. 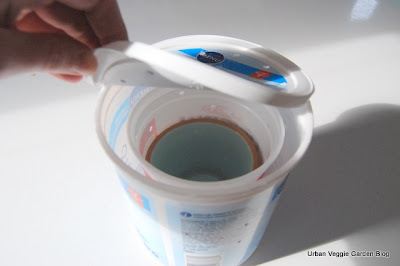 First I used a large margarine container with a perforated lid. 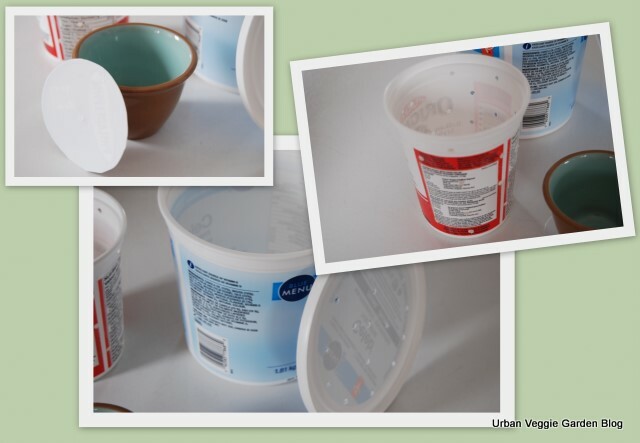 I then used a perforated yogurt container for the sprouting vessel. Lastly I used a lid cut to the inside diameter of the sprouting vessel and a ramekin to weight the sprouts down so they grow larger. 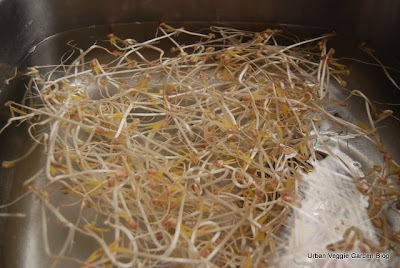 placed them in the sprouting vessel. were rinsed twice a day. Here they are on day 2, just starting to sprout. On day three they had grown half way up the sprouting vessel. water for 15 minutes. 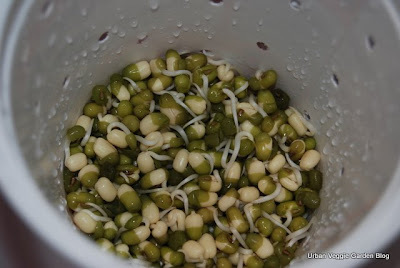 This soaking adds bulk to the sprouts. day I took the weight off allowing them to fill the container. 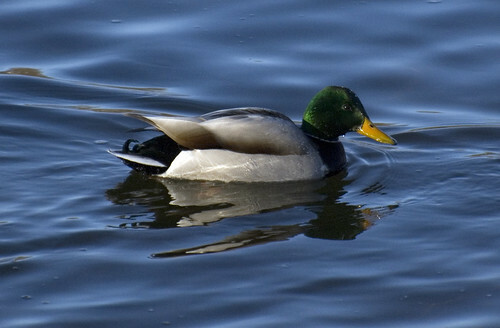 and others I skimmed off the top. remove the last of the seed coats and clean them. With that done they were dried very well and placed in the fridge. 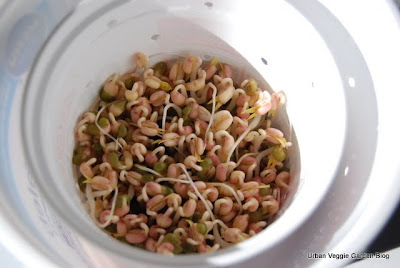 Sprouting turns out to be quite easy to do and fast as well. 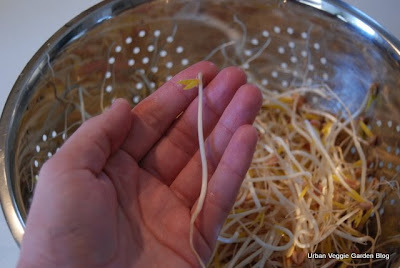 Within 6 days you can have enough sprouts for a couple meals. They also taste much better then sprouts from the store. At about the three day mark they taste just like sweet green beans, by the sixth day they take on a more starchy taste and the crunch is excellent. I see more sprouting in my future. The last seed trades have came in over the last few days, at least I think it's the last of them. If you missed any parts you can find them here, Part I & Part II. It has been a fruitful year for seed trades and I have received many interesting things. Miss M @ Dirt Happy sent an assortment of veggie & ornamental seed. Starting with the top photo there is giant celeriac, oregon sugar snow pea, toma verde tomatillo, purple tomatillo & purple sprouting broccoli. In the lower photo is pink chelone, blue baptisia, blue flax, max setaria, red leaf amaranth & perovskia. Kathy @ Skippy's Vegetable Garden sent brilliant celeriac. 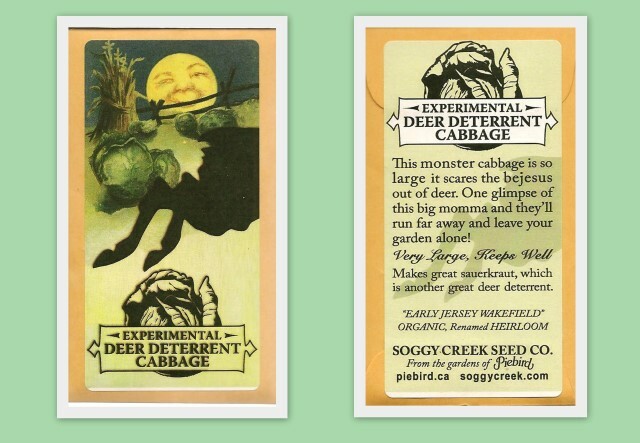 Yan @ Soggy Creek Seed Co. sent amarillo carrot, early jersey wakefield cabbage, bull's blood beet & purple plum radish which I just posted about below. Today I also did a bit more root crop planting. Feb 11-12th is a good time to sow root crops by the moon. Timing was perfect to seed the two kinds of celeriac I just received above and I also seeded some red of florence scallions that Thomas sent. 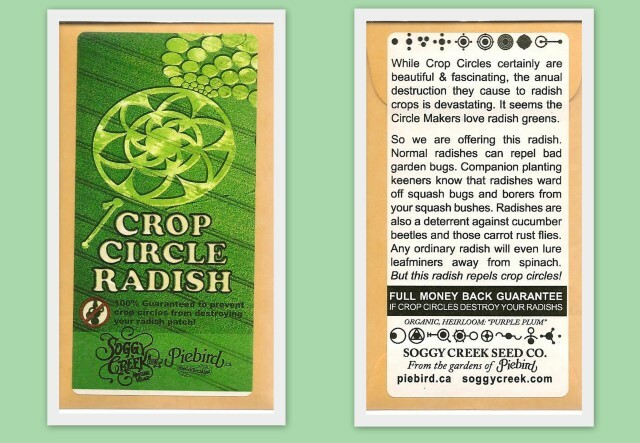 A few weeks ago I was contacted by Yan at Soggy Creek Seed Co. They are starting up a new seed business and he offered me a sample of their seeds. 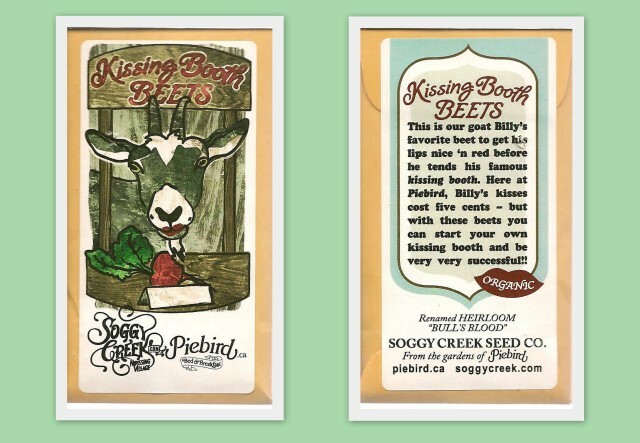 Quoting their website, Soggy Creek Seed Co. sells heirloom seeds and other wonderful things from the gardens of Piebird. 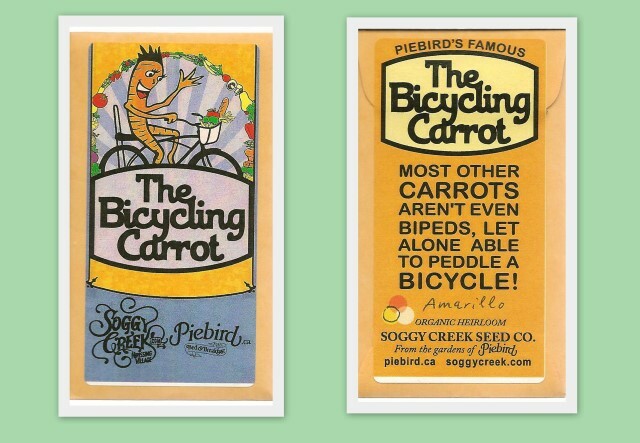 Piebird is their vegetarian bed & breakfast in Nipissing Village, Ontario, Canada. A look through their pages will present the reader with many lovely photos and lots of good information. Today I wrapped up my bean sprouting venture. It took 6 days to get to this point and they taste great. 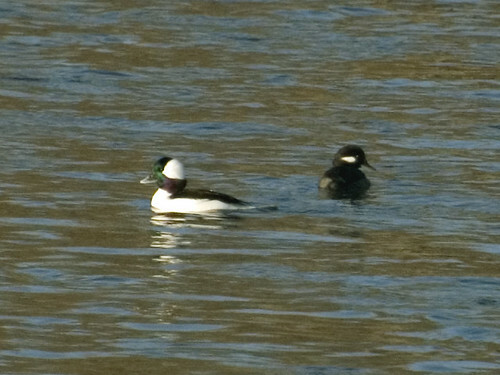 More about them later this week. Outside today I harvested the last of the green onions. Their leek like appearance comes from a combination of deep planting and having to peel the outer leaves due to cold damage. I also brought in the last of the 'Little Gem' romaine. Next winter I am planning to plant a lot more of this romaine, it is really hardy. If you would like to see what everyone else is harvesting stop by Daphne's Dandelions for the full list. I tried out some moon planting tonight for the first time. My recently seeded onions had pretty lack luster germination so I needed to seed some more. After seeing the large wolf moon last January I decided to looking into planting by the moon. With my limited reading so far I found out my planned planting date of Feb 1st would have been a poor idea as that is a barren time. 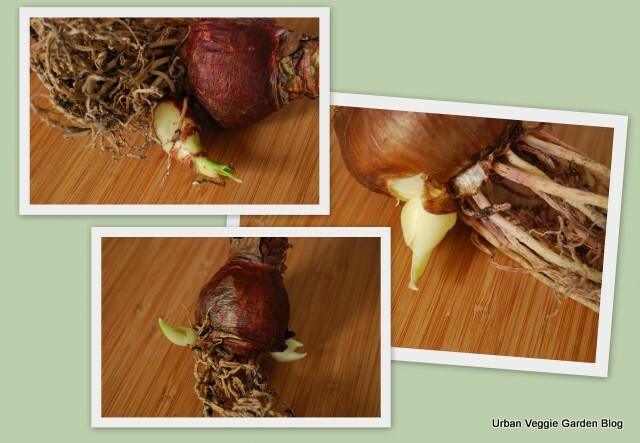 Feb 6-7th is a better time to plant roots crops during the new moon phase. If you are looking to read up more on moon planting Granny just did an informative post and the Farmers Almanac also has good information. Tonight I seeded a cell pack each of Utah Sweet Spanish onion and Amish Bottle onion. This time I planted 12 seeds per cell. I hope they germinate well so I can grow 4 plants per cell in order to have enough plant stock. If these do not germinate well I am going to have to plant sets again this year. Onions seem to be the one veggie that always cause me problems, from poor germination to weak growth to small bulbs. 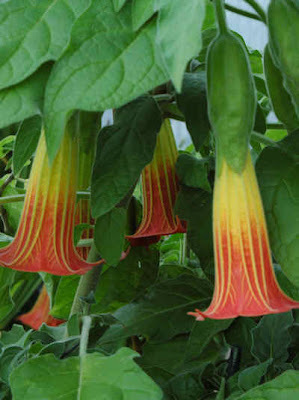 I have been trying to grow a Brugmansia sanguinea seemingly for ever. My first attempt was probably 7 years ago from Thompson & Morgan seed. The seed grew great but it turn out to be the white Brugmansia candida. After complaining I received replacement seed which then also grew out to be the white version. I then lost interest. Last year I decided to try again and order some seed from ebay. Of the 5 seeds only one sprouted and it then abruptly damped off. Clearly I like punishment so I order seed again this year from druid_moons on ebay. Again I receive 5 seeds but this time they have done really well. I ended up with three viable seeds and now have two healthy seedlings growing. The third one I accidentally cooked to death by placing it to close to the metal halide bulb. In the next few weeks it will be apparent if the seed is true. Brugmansia sanguinea have toothed fuzzy leaves so identifications will be pretty easy now that I know what to look for. Above is a photo of the flower that I borrowed from google image. It is quite a striking plant. I hope this will be the year it grows true and I will be extactic if I end up with two healthy plants.